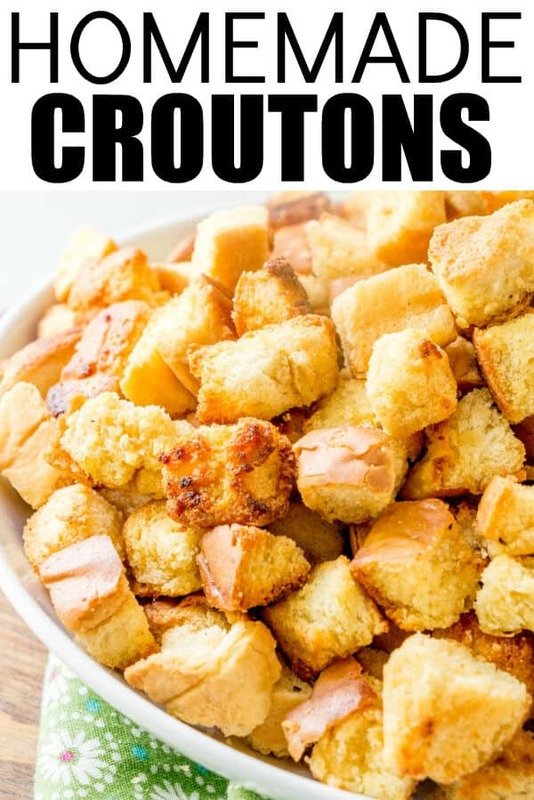 My youngest son has been begging me for croutons lately. He loves salads and I kept forgetting to pick up a bag for him to use on his salads. He can go through a bag of croutons in a day if he were given the chance to. Now I don’t mind the bagged kind, but we actually prefer homemade. 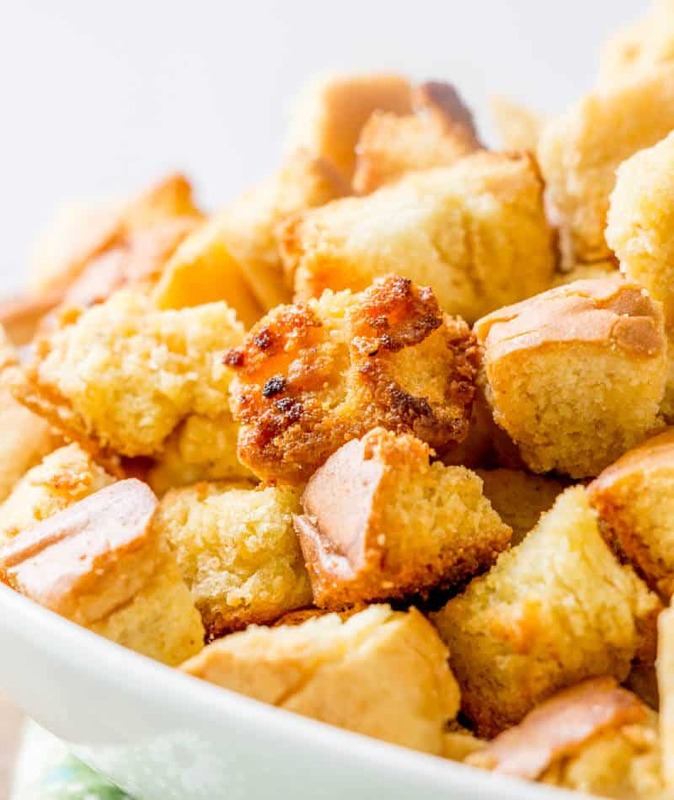 The bagged kind are a little too crunchy for my liking whereas these Homemade Croutons have a nice crunch that doesn’t overpower your mouth where you feel like your teeth are going to fall out! I mean I know that some people can relate with me on that one. These croutons are spiced with some olive oil, garlic powder, salt and pepper and that is it. Now it doesn’t sound like much, but they are addicting, whenever I make a batch I sit and munch on them throughout the day. I just cannot help it. Ok so this is my favorite part. So since it’s almost summer and with all the gatherings and picnics and cookouts, if you’re anything like me you have an overabundance of leftover hot dog and hamburger buns. 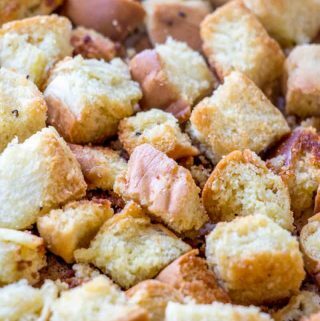 These Homemade Croutons recipe can be made out of those! 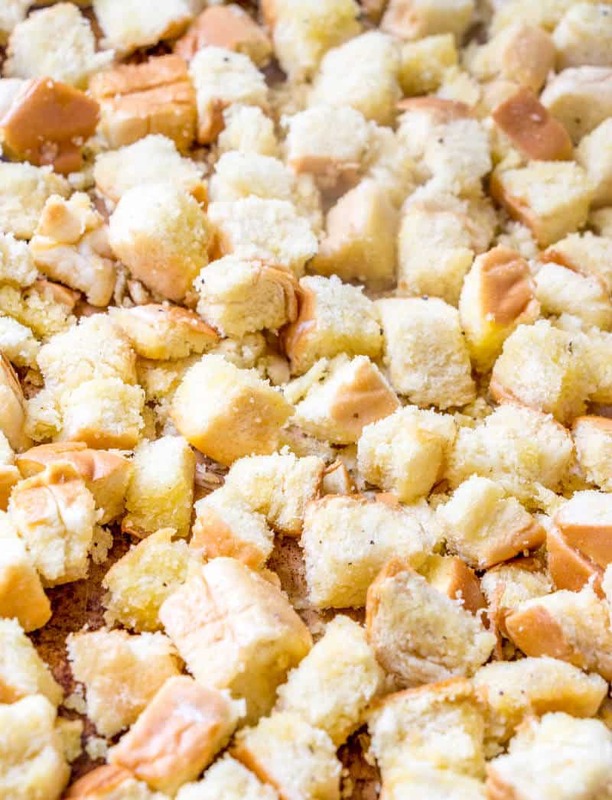 You pretty much can use any bread that you want, but we don’t like to be wasteful in this house so when we see that our buns are getting a little stale we cube them up and make the best Homemade Croutons. We actually had made this batch with some leftover Hawaiian slider buns and yum! You can use day old French bread, regular white bread, ciabatta bread, anything really. But if you want to use up some of those buns from your grilling session then that is the easiest way to make these croutons. HOW DO YOU MAKE SEASONED CROUTONS? 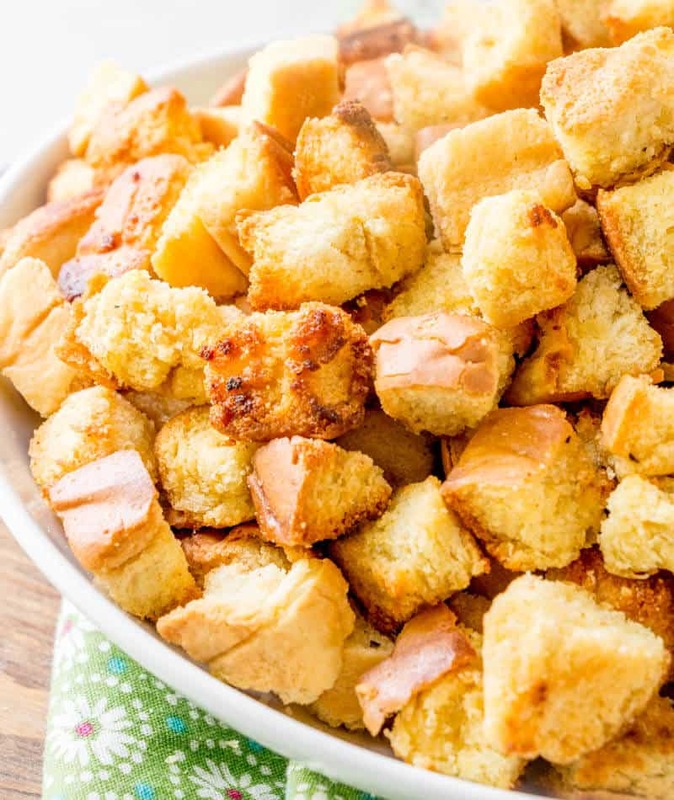 Like stated above, you can easily make croutons with some leftover bread that you’ve cubed up, olive oil and some seasonings. 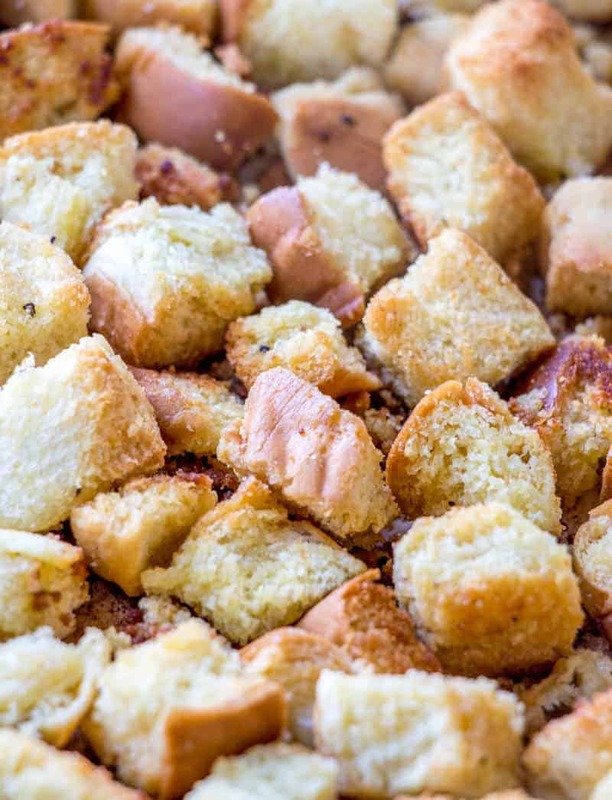 You can pretty much season your croutons however you’d like, but for this recipe we just used a simple mix of garlic powder, salt and pepper and it was enough to make us fall in love. So to make these you preheat your oven to 375 and mix together in a large bowl your cubed bread, olive oil (or butter) and seasonings until completely coated. You then spread them out over a baking sheet and bake them for about 15-20 minutes tossing a few times durning baking to get everything nice and crisp. HOW DO I STORE HOMEMADE CROUTONS? There are multiple ways that you can store these easy croutons. The best is to place them in a ziploc bag or any airtight container and they can stay at room temperature for up to three days while maintaining the same crispness. You can also freeze them in a ziploc or airtight container for several weeks, or in the refrigerator for a few days. But in reality, once you taste these homemade croutons you probably won’t even need to store them because there won’t be any left! You can serve these on a salad with your favorite salad dressing like this Olive Garden Salad Dressing. Toss them in a baggie and bring to work or in the car for a quick and easy snack. Or just munch out like I do because you just cant stop. 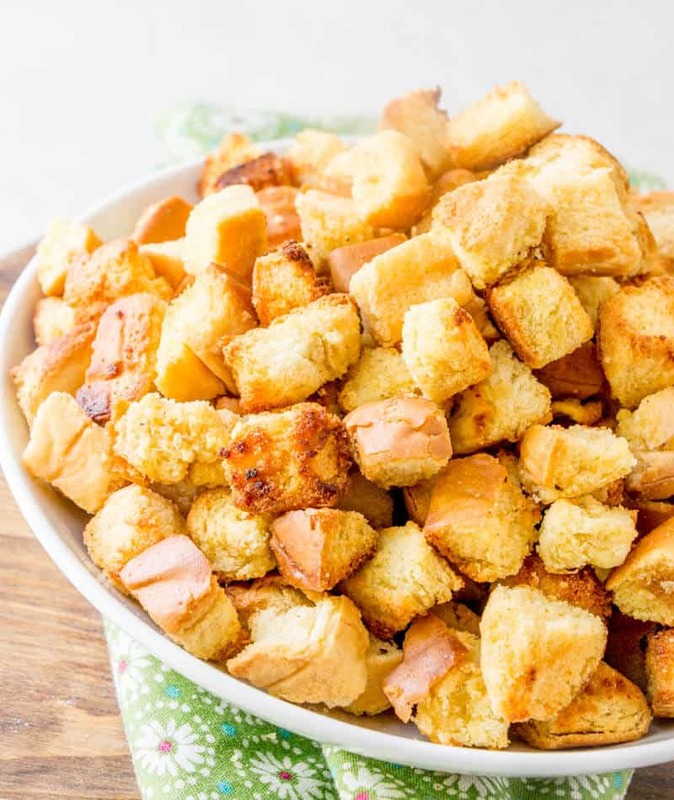 Either way, these are a quick and easy recipe that is totally worth giving a try, especially if you have some leftover buns sitting around getting stale, put them to good use and make them into these Homemade Croutons! In large bowl mix together bread, oil, garlic powder, salt and pepper until evenly coated. Spread onto a large rimmed baking sheet. Bake in oven for 15-20 minutes stirring every so often so each side can brown. We used Hawaiian slider buns in this recipe.